This remarkable fern with its beautiful variegated splendour is another of our highly admired beauty among the foliage plants that thrive in our garden. 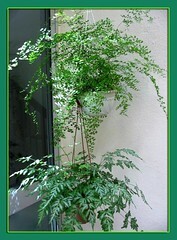 Plant type: An ornamental perennial fern, native to China, Southeast Asia and extending east to Polynesia. Light: Semi-shade to full shade with preference to bright indirect light or dappled sunlight. Do not expose it to full sun. Moisture: Regular watering as it requires an abundance of water and high humidity. Soil: Moist soil but well drained. Ideally medium light, loamy and neutral to acidic. Propagation: Propagation from spores. However, it’s more often than not being easily propagated by dividing its clumps of shallow creeping rhizomes. With a sharp and long-bladed knife, divide the root ball into half or quarter. Then, repot the divided clumps into individual pots with new soil, being careful that their crown is above soil level. Water the roots and new soil thoroughly and locate them at shady areas, and with regular watering and misting they’ll put out healthy new growth pretty soon. Features: Pteris ensiformis ‘Evergemiensis’ is an average-growing evergreen or semi-deciduous perennial fern that reaches about 30-40cm. tall and 60-80cm wide. 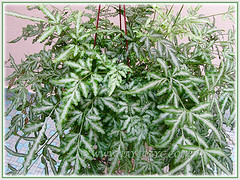 A very attractive clump-forming fern with spectacular variegated fronds that display narrow leaflets banded in silvery white throughout the midsections and radiate towards the contrasting dark green and slightly ruffled margins. Hence, commonly known as Silver Lace Fern for its lovely lacelike textures. Fronds can be bipinnate to tripinnate and arranged on their slender and variable leaf stems of medium green, which are erect when young and become pendulous with age. Also known as Slender Brake Fern, this dainty species form clusters of fertile and sterile fronds, with the long-stemmed fertile fronds rising above the sterile ones. The sori (clusters of spore-bearing organs) are found on the underside of the leaflets. 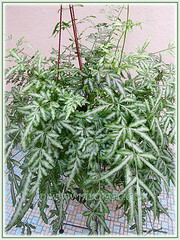 There is another Pteris ensiformis cultivar ‘Victoriae’ which is similar yet differs slightly from the ‘Evergemiensis’ in that its sterile fronds are smaller and less decorative with the variegation concentrated along the central axis. 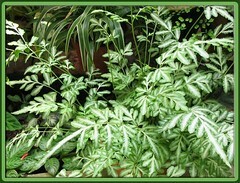 Care: Pteris ensiformis ‘Evergemiensis’ is quite hardy and is another of those easy-grow ferns with least care. Keep soil always moist, locate where it can get filtered sunlight or bright light and cool air with fairly high level of moisture (humidity). If grown as a potted houseplant, place pot on a saucer filled with gravel and water to ensure proper humidity and mist frequently. Trim or pinch off dried fronds to keep it tidy and pretty. Fertilize once monthly during the growing season with regular fish emulsion. Repot once yearly to revitalize soil and increase growth rate. Keep an eye out for pests like scale insects or mealybugs. Here’s an educative and informative read on Growing Ferns by The University of Georgia College of Agricultural and Environmental Sciences. 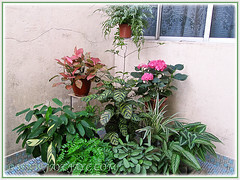 Usage: It is excellent as a houseplant in hanging baskets/pots, or as table fern in small containers, as well as in combination planter in any garden setting or patio. 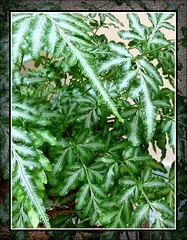 Ideal too as a decorative plant on trellis or ornamental outdoor fern in shade gardens and woodland gardens. As a groundcover plant in mixed borders, it’ll add beauty with its stunning foliage. For sub-tropical & temperate regions: Cold hardy in USDA Zones 9-11. Further info at Dave’s Garden. Epipremnum aureum (Pothos) is both beautiful and useful!